A number of folks have discussed issues with their 3-way related to the design of the outlet that directs the water into the drip tray. However, I seem to be having a different problem with the actual 3-way valve operation itself. I am trying to figure out if the is a common issue or whether something is wrong with my unit. Let me know if any of you are seeing this with your Dreams. I have noticed that my pucks are VERY wet when I remove the PF, like the pressure is released but almost no water is removed from the top. More telling is when I run the pump with the rubber disk in the basket, and then shut it off, even though some water comes out the 3-way into the drip tray, when I remove the PF hot water sprays out. It seems like the 3-way is not staying open long enough to fully equalize the pressure. I suspect that the reason my pucks are so soupy but that I don’t get sprayed, is that the excess pressure is released through the grounds between the time the shot turns off and the time that I remove the PF. I do get a lot of dripping after the shot stops which reinforces that there is still pressure on the puck after the 3-way is done. In essence, the 3 way only has to "burp" to bring the pressure down, but perhaps the setpoint or timing of this burtp is too short to completely depressurize the system. In my plumbed in Dream, after a shot, the pressure is at about 5.5 bar as read out on the display, until i remove the PF, and then run a bit of water through using the middle button. Since I have a pre-infusion time set, the pump doesn't come on for this short time and the pressure decreases back down to line pressure of 4 bar. However, if I leave the water on past the preinfusion time and the pump comes back on, then I stop it, even without the PF mounted, the pressure sits at the 5.5 bar point. So, yes, I think they need to slightly increase the time the 3 way is open, so that all the pressure is released. Firmware update required? I heard back from Jason at CCS. Most of the other postings here in the S1Cafe were about the three way getting plugged up with deposits and leaking inside the machine due to the "plug" in the end of the 3-way discharge fitting. This appears to be a small wad of stainless steel wool jammed into the barbed back end that connects to the plastic hose from the 3-way and then dumps into the drip tray. CSS refers to this as a "screen". This was initially put in there to keep the flow rate low enough to prevent water from hitting the bottom of the drip tray with so much force that it splashed back up and all over the inside of the machine. Well even when it's not plugged up with coffee deposits it restricts the flow too much so that the 3-way doesn't release all the pressure fro the PF. It makes for much more watery pucks when pulling shots and sprays you when you remove the PF after backflushing. Since I already have the fitting with a plated welded over the back have of the hole on my Dream, all I had to do was remove that wad of steel wool. That seems to have done the trick, but I'll give it a couple of days of use before I proclaim it definitely fixed. It sounds like CCS is rigorously testing this solution. Once they are happy that they have it licked, they'll be contacting current owners. One's like myself with the new fitting will just have to remove the screen. Other may get the new fitting to use to replace theirs. I think at least some, if not all the owners with the old fitting may also have the screen installed. Chas, my new DreamT does the same thing.mine actually blew the hose off when I back flushed it. I'm anxious to hear your and CCS remedy. I have the cover off currently to observe the process. The thing that baffles me is why they redesigned this when it worked fine in the previous generations. It has nothing to do with any of the other Dream updates and those updates don't cause any interference that would have prevented them from using the old 3-way plumbing. Between the great phone support from the CCS techs and the support available here on this Forum, most folks are able to resolve issues themselves. I think very few folks actually return their machines for warranty service, so your machine won't break CCS the bank. Owning an Italian Espresso machine is a lot like owning an Italian sports car. You will quickly find yourself buying a set of metric tools and doing most maintenance yourself or you will be forced to find a local "mechanic". I've had my mesh out for a week now and the machine works perfectly. No wet pucks, water only in drip tray, pressure decreases correctly. I now believe that my original observation that the discharge hose was not connected was in fact caused by it blowing off when the mesh got plugged. Thanks, Chas! I heard from Jason at CCS this morning and I "over assumed" in yesterday's forum posting about the solution they are testing. It is actually a new solution altogether. He also makes it sound like LaSpaziale is working on their own independent solution. I have also asked Jason if he has any idea why LaSpaziale changed to this design from the previous 3-way plumbing design that worked perfectly. I have a sneaking suspicion it was to save the difference in cost between copper tubing and plastic. The solution we are working on now, we removed the screen and instead of the 1/2 plate soldered on, we put on a full plate covering the exit hole and then drilled some holes in that. The holes are just big enough to allow the water to drain, but will not get clogged. We just want to do some more testing with it to make sure it works with a buildup of coffee or detergent, but should not clog so I think we should be fine. Still waiting to hear what Italy's solution is. Jason says that the larger plastic box needed to hold the controller board and the placement of the programming port were in the way of where the 3-way plumbing was previously routed, necessitating the change. 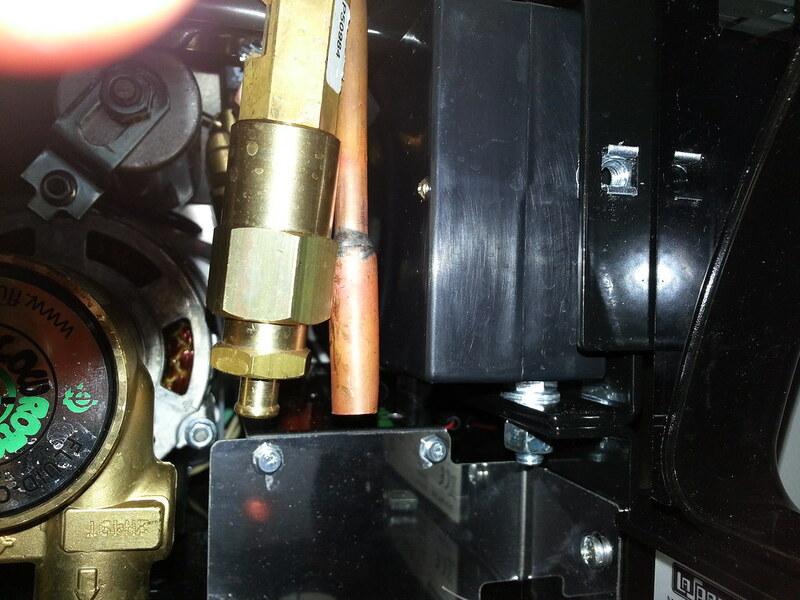 All that is to the right of the expansion valve (in the plumbed Dream) and the 3-way tube used to be on the left of the expansion valve so I did not think that interference would be an issue. However, I have not looked inside an older model in over three years so I am probably remembering something wrong. Jason, also shared a new discovery with me that will be in the new rev of the User's Manual. However, it deserves its own thread. Below is a photo of the LaSpaziale solution. CCS will be getting some of these to test soon. Once they decide whether to use this solution or their own, they plan to post a video on how to replace the part and then send the part to all current owners. Looks like the la spaz solution just extends the discharge deeper into the body of the drip tray. I think that would be preferable to something that could plug up over the long term. In any case, its pretty cool the level of response this is getting from both the manufacturer and the distributor. It didn't dawn on my originally that issue might also be caused by the now apparent 3-way design issues. But it no doubt is. Agreed! The universe unfolds as it should. This forum has been a great help. Now that the screen is out, all is good. I just got my machine back from CCS where they replaced the 3-way and fixed a bunch of leaks and updated the software. I must say it's like having a different machine. They OPV correction makes so much difference! My pucks are dry and easily knock out of the PF. no leaks and now the timer works like a charm. CCS was great about the return shipping- I paid nothing both ways! I'm a very happy owner! Chris: Good to know you are now a happy camper! For those of us who have not had this service done, is there a detailed description of exactly what CCS did to your machine other than the firmware update? You mentioned the OPV? Why did they replace it? maybe i am mistaken about the name of the part. i'm talking about the release of water after the shot. prior to fixing, it dumped into the bottom of the machine and missed the drip tray. now it goes where it's supposed to and it's perfectly dry. Ok. Thanks. It sounds like they replaced the fitting that is shown in this thread with the newer version. Thanks for the info. I wonder whether they will make this longer fitting available to all owners. Just as a cross reference, I got a new replacement machine because of issues with my first. It came with a completely different 3 way discharge arrangement. Interesting. I am not sure why they didn't go with this arrangement in the first place. I guess the fix they are working on will just be for those that currently have Dream machines and those with newer ones will be getting this arrangement.